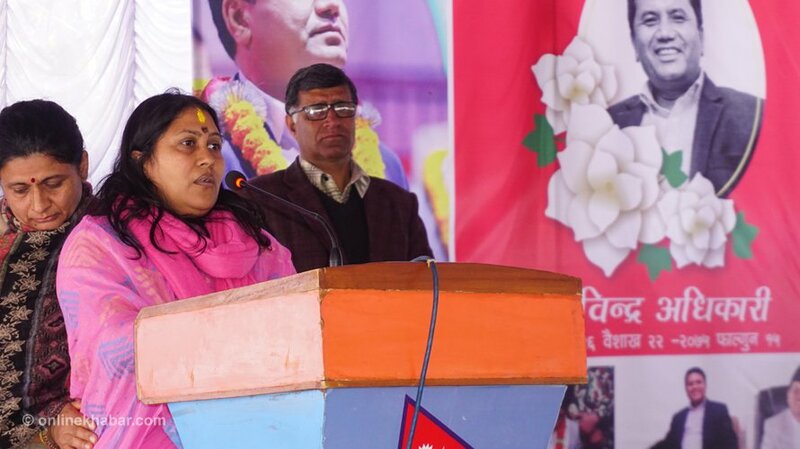 Bidya Bhattarai speaks at a function organised to condole the death of her husband, Rabindra Adhikari, in Pokhara, March 2019,. The date for a House of Representatives byelection in Kaski-2 has not been fixed yet though one and half months have already passed since the demise of incumbent lawmaker Rabindra Adhikari in a helicopter crash. However, local cadres and leaders of the Nepal Communist Party have put pressure on Adhikari’s wife, Bidya Bhattarai, to get ready to contest the elections. Most of the leaders in the district have viewed that Bhattarai will be the best candidate to carry on Adhikari’s ‘legacy’ as she was politically active in the student life, and can get sympathetic support from the voters. Central leaders of the party have also hinted that Bhattarai can get the candidacy ticket if she wishes so. Days after Adhikari’s death, NCP chairman Pushpa Kamal Dahal said the candidate would be picked only after consulting the deceased leader’s family and local leaders. Another central leader Yogesh Bhattarai reiterated that a few days back. Bidya Bhattarai, who teaches sociology at a college under Tribhuvan University in Kathmandu, however, is still uncertain about the candidacy, according to family sources.